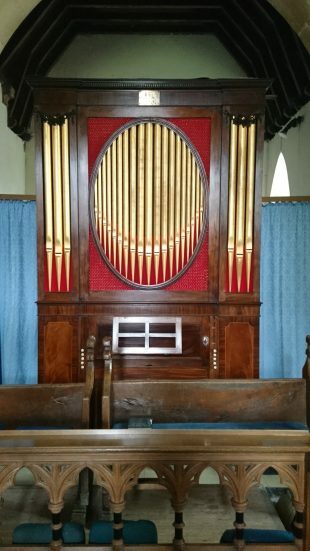 In 1981 Martin and Dominic carried out their first restoration project on the 1786 Samuel Green chamber organ in the church at Edith Weston. The main concern then was to reverse the effects of damp and corrosion, and much was left unrestored, including the finish of the case. Now the pipe front has been restored by Nick Hagen with brass chicken wire and red silk, paid for by 2 Medical Regiment who are leaving MOD North Luffenham, which is closing.